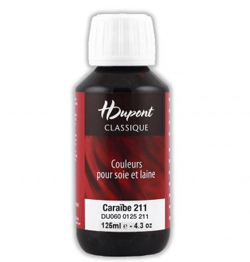 We are very pleased to stock the Dupont range of steam-fix dyes, used by many professional silk painters. We now stock the complete range of colours in 125ml bottles. Now manufactured by the Clay & Paint Company, the original dye formulations and quality have been retained. The new manufacturers have renumbered the colours and removed many duplicates from the range. The basic colours for mixing are 221 Cyan, 460 Magenta and 717 Jaune Primaire. You may also find a 100 Noir useful. It is impossible for us to stay in stock of all colours at all times - if you have any alternatives please let us know in the Comments box as you complete your order.